The Scarlet Hour is an outstanding surprise for noir fans : directed by Michael Curtiz in 1956, it is so rarely seen. And it deserves to be rediscovered on DVD. Carol Ohmart uses Tom Tryon to get rid of her husband. And there are so many tricks and twists growing violently crescendo all through the movie, you get stuck on your seat. That crescendo is brilliantly enlightened by Lionel Lindon ("Quicksand"), each frame being in perfect adequacy with all the events and accidents. Frank Tashlin is another great talent of this forgotten jewel. He is a specialist of comedies, "The Girl Can't Help It" and Jerry Lewis movies. 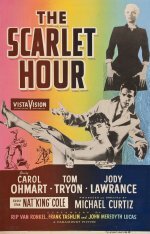 "The Scarlet Hour" is his only participation to film noir. The second screenwriter is John Meredith Lucas, the foster son of Michael Curtiz, who had written Dark City in 1950.